Coming down the home stretch now -- I'm just two days from Chicago and the end of this particular trail. Today's Lincoln Highway drive took me from Salt Lake City to Cheyenne, Wyoming. This route reminded me of Route 66 across Arizona: mostly on the Interstate, with business loops through old western towns with wide main streets, occasional scenic meanders away from the Interstate, and a long loop well away from the divided highway. Leaving Salt Lake City to the east, the road climbs through a series of canyons. The first must be driven on the Interstate, but in the second, Echo Canyon, the Lincoln Highway splits off as a narrow, two-lane road next to the Union Pacific line. From the Lincoln, the Interstate can be spotted a mile away as it dominates the surrounding landscape; from the Interstate, the Lincoln is virtually invisible. Through most of this leg I was listening to a radio station format I hadn't heard before: an all-Seventies station, playing everything from Aerosmith to Olivia Newton-John! At best, the mix brought back memories of long-lost youth; at worst, the Sincere Singer-Songwriters of the era brought back the late rock critic Lester Bangs' fantasy of >taking a broken bottle to James Taylor. Hadn't heard "Ben," Michael Jackson's love song to a rat, in at least a decade, and even Rupert Holmes' execrable "Escape (The Pina Colada Song)" reminded me of an incident in college when Roni D., awakened from a sound sleep, shattered a wood panel in the bathroom door while attempting to silence John A. 's shower rendition of Holmes' followup "Him" ("You're gonna have to do without him or do without me, Me, MEEEE!!"). Back on the road, the scenery around Green River, Wyoming (gateway to Flaming Gorge National Recreation Area) rivals almost anything in Utah. Further on, got a startling photo of the remains of the Red Desert Cafe, which seems to have imploded during a windstorm, then detoured at the Continental Divide to a long-forgotten monument honoring Lincoln Highway pioneer Henry Joy. Looking west from the Joy monument, the long-abandoned 1939 LH roadbed recedes into the distance just south of the mighty Interstate. Just as Route 66 veers away from I-40 from Seligman to Kingman, Arizona, the Lincoln Highway/US 30 veers away from I-80 between Laramie and a point east of Rawlins, Wyoming. This loop passes through Medicine Bow, Wyoming, where the Virginian Hotel (1911) was inspired by Owen Wister's The Virginian, one of the first Western novels. Medicine Bow also boasts an impressive display of regional cattle brands. Further on, Como Bluffs has a house constructed entirely of petrified dinosaur bones found in the area. Laramie and Cheyenne are barely forty miles apart, but in between the Interstate and Lincoln Highway traverse a ridge over 8,600' high. 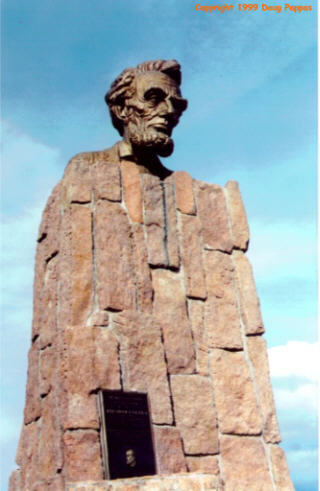 At the summit, the World's Largest Bronze Head -- an especially ugly likeness of Abraham Lincoln, 12-1/2' high and weighing 3-1/2 tons -- overlooks the interstate from a rest area. The area also boasts a turnout in the center of the Interstate for Tree Rock, growing out of a boulder and once nourished by crews on passing railroad trains, and the Ames Monument, built in 1881-82 to honor the brothers who had been the chief financial backers of the Union Pacific Railroad. A few years later the tracks were moved away, the brothers were indicted in connection with their activities on behalf of the railroad, and their grand, 60' high pyramid sits in sad isolation.